I’ve gotten a few questions lately about vermicomposting -composting in a small bin using worms. 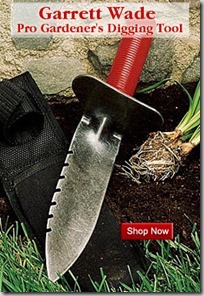 Folks seem to know that worm castings rock, and they are really expensive to buy. Other folks want worms for fishing. And still others just want a simple way of keeping their veggie scraps out of the landfill. My answer to this has three components. I think it’s cool to have an effective way of composting kitchen scraps that doesn’t take up much room. Most small-scale home composters don’t seem to work that well. (I do like some of the tumbler-style ones, but the Darth Vader heads – you can’t really get in there with your shovel to mix it up, so the stuff doesn’t break down.) Worms work. Nope. I just put some scraps in there twice a week and add some shredded newspaper every couple weeks. When the bin is full of castings, you just start a new one on top, making sure the worms can crawl up the old newspaper bits and get to the fresh new food and newspaper shreds you’ve given them in the new box. At some point, the worms figure out that they’ve eaten the good stuff in the lower level and abandon it, and at that point you can use the castings in the garden. Doesn’t it smell? Aren’t worms kind of icky? No, they totally don’t stink at all – it’s only vegetables in there and the worms break them down pretty quickly. And to whomever asked that “icky” question – we can’t be friends anymore. Please go home and sulk at your sudden banning from the gardening in-crowd. What type of worm bin do I get? I like the Wriggly Wranch, the Worm Factory 360, and the Can O’ Worms. They all have multiple vented trays, spigots at the bottom to drain off any vermicompost tea, and tight-fitting lids that keep flies and such out. The Wriggly Wranch is rectangular, the Worm Factory 360 is square, and the Can O’ Worms is round. That seems to be the main difference. 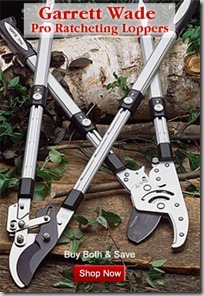 I have a Wriggly Wranch but have friends who use the other two kinds, and they are all functional and sturdy. Can I make my own worm bin? I’m kind of DIY like that. Yes, you can make your own worm bin fairly easily. But harvesting the finished worm castings/ vermicompost from the single-layer homemade bin that many folks start with is a pain in the neck and involves picking out each individual worm that’s still chillin’ out in there. That’s fun if you’re, like, four – but less so if you’ve got other things you want to do with your time. When you have a commercial bin with multiple trays, you can just start adding your veggie scraps to the new tray, making sure the worms can crawl up the newspaper shreds to reach the good fresh compost you’re adding. At some point, since the trays are separate, the worms do abandon the old tray and you can use the worm castings without having to pick through them by hand. If you do want to try making your own bin, this video shows the basic one-bin type that is a pain to empty, and here is a tutorial for making a 3-layer type, like the commercial bins available. It’s a little ghetto, but looks very effective! So, uh, what do I put in there besides the worms? Many commercial bins come with a block of coir to start with, or you can buy blocks of coir (coconut peat) at the nursery. You can also start with either rice straw or shredded, slightly damp newspaper (non-glossy, black and white only). Just floof it up really good so there’s some airflow. Add a tiny handful (really – just a bit) of soil for the worms to use as grit to aid in their digestion. They don’t eat the soil – they eat decomposing vegetation – so they don’t want much. Or you can add some eggshells instead. What type of worms do I get, and where can I buy vermicomposting worms? Get the red wigglers, or Eisenia foetida. You can find them in a number of places online (here, and here), or if you have generous worm composting pals, they can give you a handful to get started. Where do I store my worm bin? Some folks store them indoors, but there are horror stories online about the worms abandoning ship if conditions become undesirable. I am guessing this happens much more often in homemade bins than in the comfortable commercially-made ones, but I personally would probably put it outside or in the garage. If you do want to store your worm bin inside, a nightlight can help discourage them from exploring, since they don’t care for light. Also, take care not to set them right up against an appliance that causes vibrations, or on a freezing cold floor. My worm bin has just a few fruit flies, so I’d also pop a Sundew (a carnivorous plant) in your window if you keep it indoors. You want the worms to stay at a reasonably steady temperature, not too hot and not too cold. I put mine on my covered patio outside, where it won’t get rained on and won’t get too baked in the summer heat. I live in a relatively warm climate though, so you might want to bring yours inside for the winter. Anything vegetable is good. They LOVE pumpkin and melon guts, banana skins, lettuce and strawberries. They’ll also take tea bags, coffee grounds, eggshells, stale bread, tomatoes, potatoes, pineapple, cucumber, oatmeal, apples, plums, carrots… You can experiment and see what they’ll eat and what just sits. I bury the scraps just underneath the top layer of shredded newspaper so they can find it all, and I just notice how much they’re getting around to eating and how much sits. When you first start out, there are fewer worms so they won’t eat as much. As you go, you’ll want to feed more each time. Try not to give them so much food that it sits and molds before they can eat it. What can’t I feed them? No meat, no oily stuff, no eggs (shells are good though) or proteins or cheeses. They don’t seem to care for citrus or onions, and hot peppers might burn their skin. So what do I do with all that worm compost, anyway? Add it to your houseplants or container plantings to help them retain moisture. Mix into your seed-starting soil to help seedlings or transplants have consistent moisture. Top-dress in flower beds where extra nutrition or moisture is needed. OMG! I love worms now. Please help me be a ridiculous worm fan-girl (or boy). Go read Amy Stewart’s book The Earth Moved: On the Remarkable Achievements of Earthworms . You’ll have a new appreciation for them after reading how some of them have lily-scented coelemic fluid (their slippery coating, and no I am not calling it slime!!) and the many ways they’ve had an impact on our world. Amy also has a quick worm composting fact sheet here. Pick up Mary Appelhof’s book Worms Eat My Garbage if you want to know more about worm composting than any human being should rightfully know. 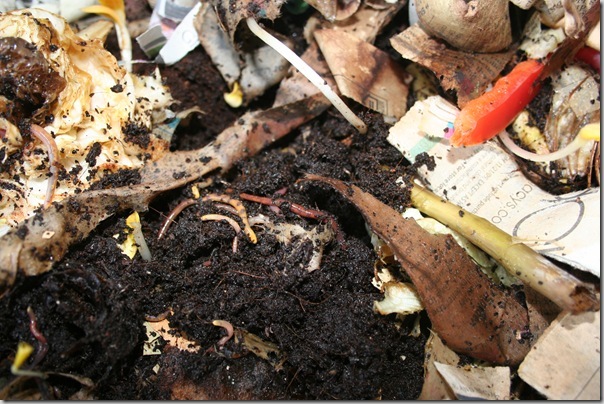 Ask your worm composting questions on the Garden Web Vermi-Composting forums. Or you can make your own super-cool worm t-shirts. I want to do this! Have fun, fellow worm geeks! What a fun and informative overview of worm composting. I’d never really thought too much about trying it but you make it sound like a no-brainer. Any idea what people in cold climates like mine do over the winter? I don’t think I want the bin in my house and the garage will be too cold. And I wonder if the compost will stay fresh over the winter . I guess I have a new project to investigate! 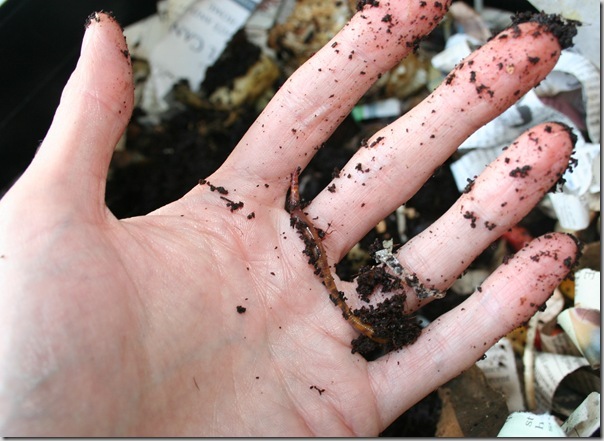 Nice overview of vermicomposting for the home gardener. I really need to start doing this. Worms will break down your compostables faster than anything else and the beneficial biology you get from them does fantastic stuff for your soil & plants. Worm compost makes an awesome compost tea also, which can be poured into planters/pots, or strained and applied as foliar spray, which is a great way to keep your plants super healthy and disease resistant. Debbie, I sure wish I knew what cold-climate peeps did. I know Susan Harris has hers inside up off the floor. I know she is in a colder clime. I think the compost stays very nice when stored. I have some year-old worm castings that I’m still slowly using up and they’re still holding moisture well and looking like they did when brand new. A little drier to start. Thanks for the tip re worm tea, Matt!! You’re right – I do get some worm tea out of the whole deal. I’m too lazy a gardener to spray my plants with it, though – they’ll just have to enjoy it in the soil! My worms seem to be dying by the hundreds (or they’re hiding really well). The bedding is moist and does not smell. However, for bedding, in addition to shredded newspaper , I used organic coconut fibers (the kind used to line hanging planters, not the compressed cocunut coir sold in blocks, which I couldn’t find at my local garden store). Do you think that might be the problem? Oh Jenni, I am so bummed for you! I have no idea what’s going wrong for you. I would ask for the folks over at the garden web worm composting form (link above) and see if anyone can offer any advice. What a bummer! My worm composting’s gone so smoothly that I don’t have many troubleshooting skills yet. Nothin’ like worms to cheer up the garden! Is there a link between the moisture and the appearance of mites in the bing? My bing is quite moist and there’s white a bit of those bugs in there? I wish I knew, Roch! Have you read Worms Eat My Garbage? That’s a pretty thorough book on worm composting that your local library should have. It might say in there?